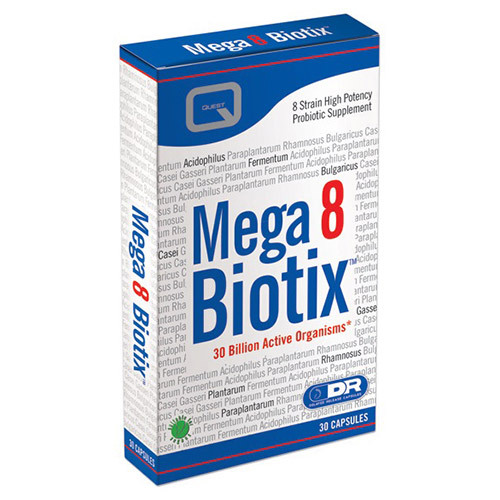 Quest Mega 8 Biotix is a high potency probiotic supplement that contains 8 strains of lactobacilli probiotic bacteria. Probiotics also support the metabolism and utilisation of nutrients from food, as well as assisting with the detoxification and excretion of hormones via the liver. 100% vegan friendly and free of allergens such as dairy, gluten and nuts. Take one to two capsules per day - with or after a meal. Maltodextrin, capsule shell (hypromellose, gelling agent: gellan gum), lyophilised lactobacilli culture, Magnesium Stearate, Ascorbic acid (antioxidant). Contains no hydrogenated fat; animal subtances, artificial preservatives, colours or flavours; added sucrose, lactose or salt; yeast, wheat or gluten. Do not exceed the stated dosage unless instructed by a qualified health professional. Food supplements should not be used as a substitute for a varied and balanced diet and healthy lifestyle. Keep out of reach of children. Store in a dry place, below 25 Celsius. Below are reviews of Mega 8 Biotix - Probiotic - 30 Capsules by bodykind customers. If you have tried this product we'd love to hear what you think so please leave a review. I had purchased Mega 8 previously and found them beneficial. This time I opted for a multi-buy discount as I found these probiotics worked well and as they contain 8 strains one knows it's a good product. The multi-buy option provide genuine savings. I have crohn's and functional gut disorder. I have been taking these for a few months and they are very good I noticed a difference quite quickly around a 1-2 weeks and suffer if I forget to take it. I take 1 a day just after food or two if I'm having a worse day with symptoms. I really recommend them and wouldn't be without them now. You can store in the fridge and I also take a few with me if I'm out and about just keep them as cool as possible. I do have to take other medication for my crohn's but these definitely help a lot. Worth a try hope they help you. This is one of the best probiotics I have used. It is very potent and very effective. I used it when I started to come down with the Flu, and after 3 days I was back to normal ! Usually it takes me a week to get over the flu completely, sometimes even longer, so this is very potent stuff. It is also very benefical to use this after you have taken a course of antibiotics which destroys the gut flora, by taking these after, you can ensure you wont get ill again. 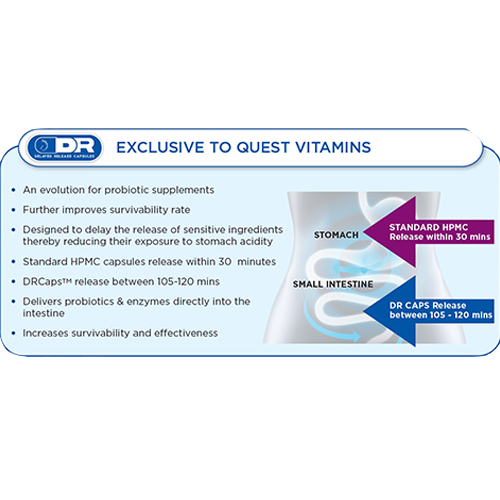 I highly recommend these probiotics by Quest. 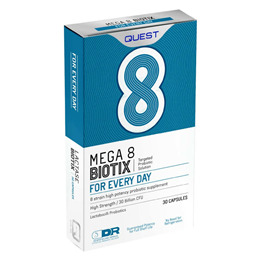 Quest Mega 8 Biotix is a high potency probiotic supplement that contains 8 strains of lactobacilli probiotic bacteria. It provides everyday support for digestive health and probiotic bacteria to reinforce the intestinal lining.